It’s easy to make low carb keto fried chicken in an air fryer. But if you don’t have this trendy appliance, the chicken can be baked in a regular oven instead. 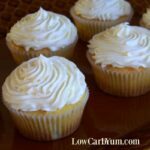 CLICK HERE to save the recipe to Pinterest! What a difference a couple decades makes. I used to make my family fried chicken about once a week. I’d bust out the deep frying pan, Crisco vegetable oil, and high-starch bread crumbs. About half hour later, we’d have a heart-attack on a plate. But boy did it taste good. After the meal was over, with blissful ignorance of the grease coating and clogging my insides, I’d somehow manage to get all the dishes done even though I was in a food coma. 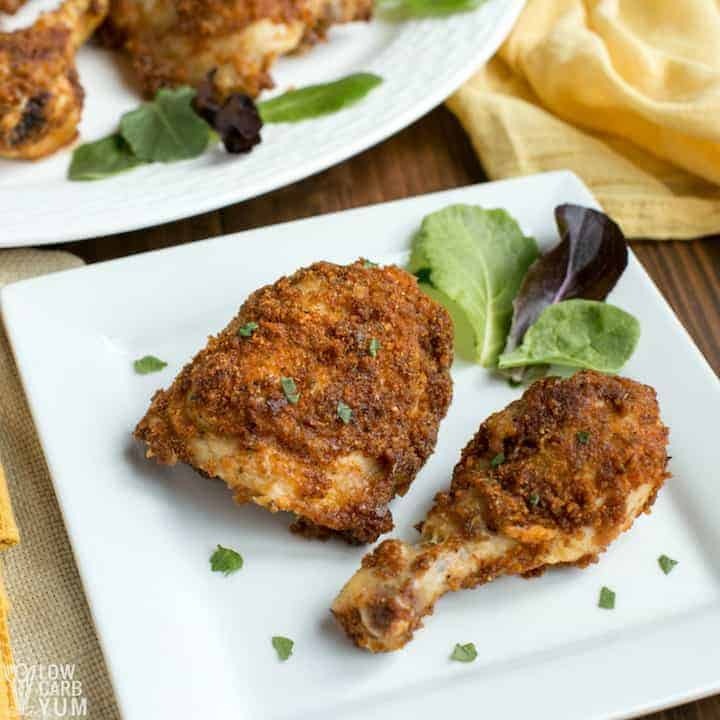 These days, well after my move to low carb, I’m happy to say that it’s possible to create a keto fried chicken recipe that’s just as tasty as the old-school way of doing it. For this recipe, there’s at least a couple surprising ingredients. Almond Milk & Air = Chicken? The first is, if you’re not using an oven, is an air fryer. 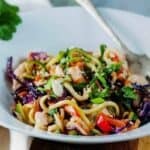 Hopefully, you have a big enough kitchen because it seems like every year, there’s more gadgets that are a must-have for healthy cooking. 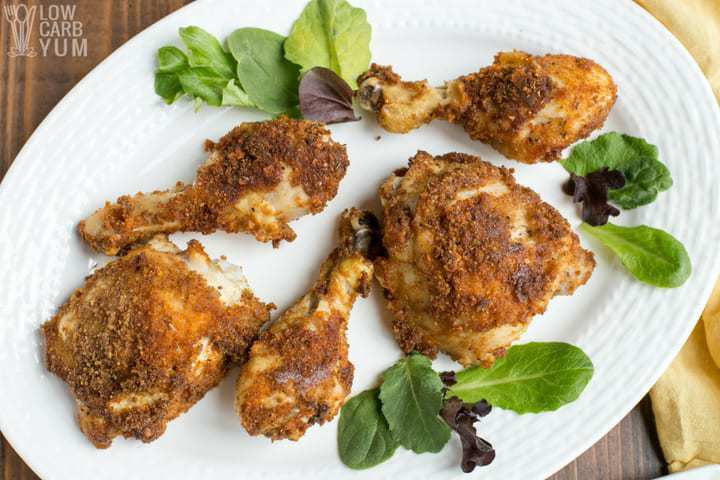 Fried chicken in an air fryer is quicker than using an oven. 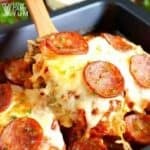 It’s also perfect for low carb French fries or mozzarella sticks. 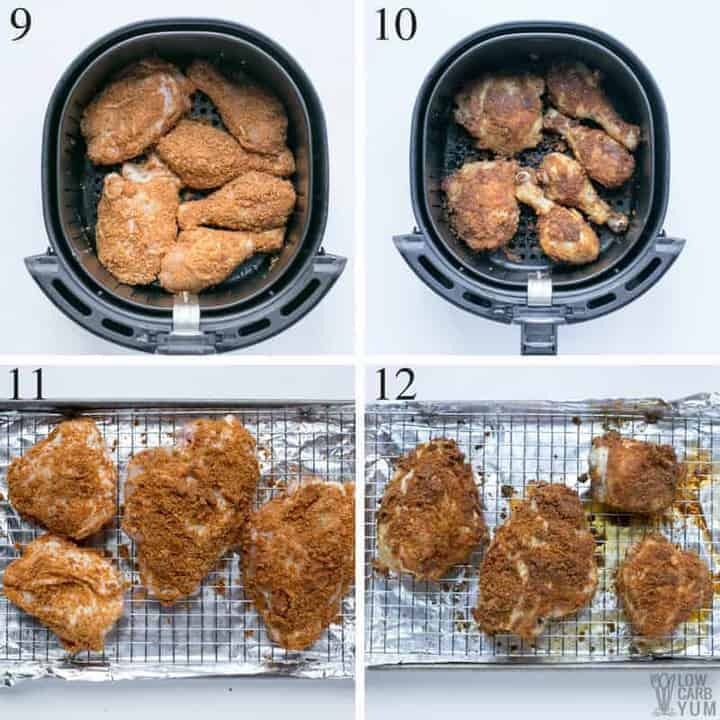 Now, if you’ve never used an air fryer, here’s basically how it works…. It circulates hot air around the food. Instead of frying something in a vat of scalding hot, rancid vegetable oil, the hot air cooks it all the way through. The other unusual element of this recipe is I use almond milk. 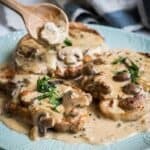 I’m sure in the Deep South, where recipes for this dish are passed down in secret like spy codes, almond milk is not a ubiquitous ingredient. 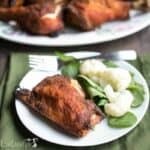 However, it’s perfect for keto fried chicken. And here’s why…. Buttermilk is a staple of southern fried chicken. But dairy causes sensitivities or allergic symptoms in many people. That’s why dairy-free almond milk is much safer. 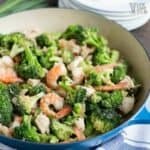 Along with the coconut oil and vinegar, the almond milk isn’t going to make this recipe taste like a watery, soggy disaster. And you won’t taste the nutty flavor either. Step 1 is simple. Just put the 5 pounds of chicken in a bowl (photo 1). I like having breast, thighs and wings instead of just one part. But if you love just the wings, that’s fine. Mix the one cup of almond mix and one tablespoon white vinegar together (photo 2). Then, pour the mix over the chicken (photo 3). Place for 2 hours in the refrigerator. Binge watch your favorite show or read a book or go exercise. Actually, while the chicken is in the fridge, you can prepare the add-ons. In a wide, shallow bowl or dish, combine the pork rinds (photo 4), salt, thyme, basil, oregano, celery salt, black pepper, dried mustard, paprika, garlic salt, ground ginger and white pepper (photo 5). Make sure the ingredients are mixed well (photo 6). 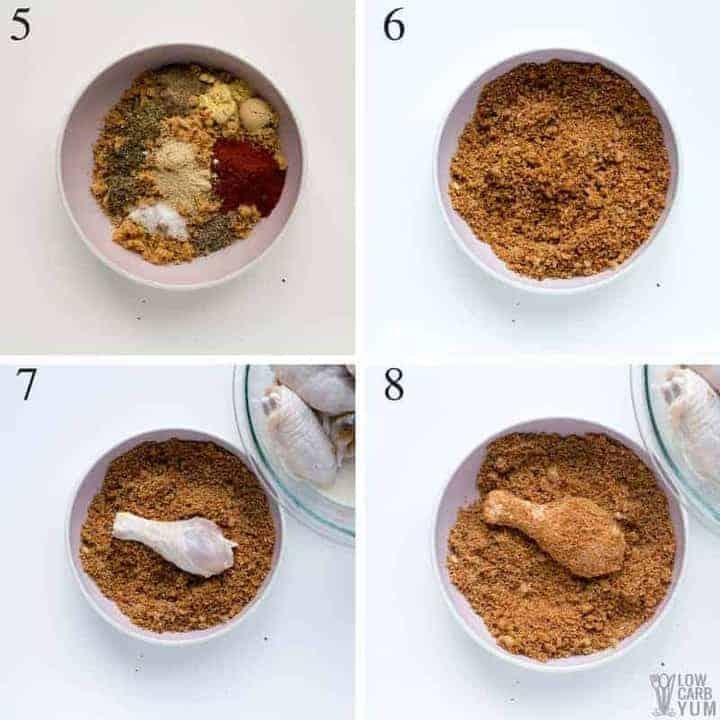 Next, after the chicken has cooled in the fridge for 2 hours with the almond milk and vinegar, take it out, and dip each piece in the pork rind blend. All pieces should be well coated (photos 7 & 8). In the air fryer basket, spread a tablespoon of coconut oil. You can experiment with other oils such as avocado. Just make sure not to use any vegetable oils (no corn, soybean, cottonseed or canola oils). You’ll then arrange the chicken in a single layer in the basket of the air fryer. (photo 9) Set the temp to 360°F and air fry for 10 minutes. The meal isn’t quite done at this point. First, rotate the pieces (photo 10). Then, air fry for another 10 minutes. Hopefully, you have a cooking thermometer and can test to make sure the pieces reach 165 degrees. You might think that an air fryer takes much longer than a conventional oven. But actually, it takes less time. As for the pork rinds, they really don’t make this healthy poultry meal less healthy. In fact, some people upon hearing pork rinds are Paleo- and Keto-friendly do a double take. That’s because when most people think of pork rinds, they think of the highly-processed snack pack that are sold in vending machines. But pork rinds can be minimally-processed, artisanal and even organic. Considering that conventional bread crumbs are very high in insulin-spiking carbs, nitrite-free pork rinds are a healthier option. This meal is definitely not a plant-based meal. 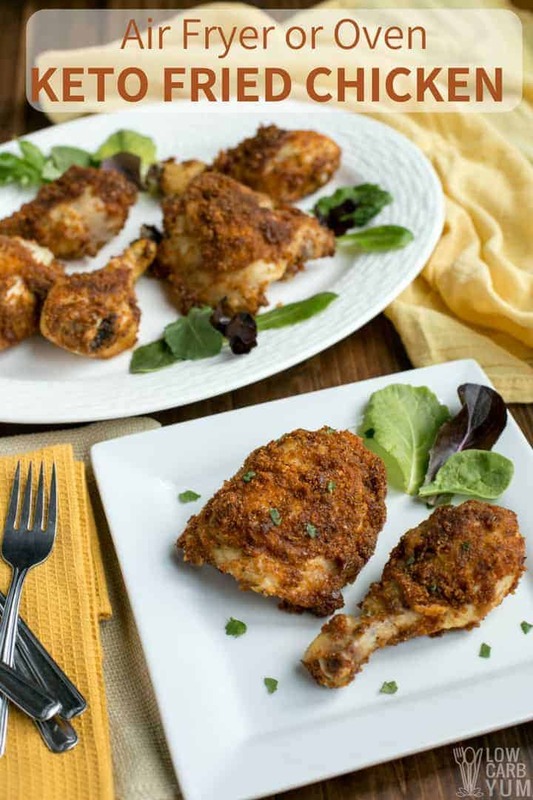 However, once in a while, when the family gets a craving for fried chicken, indulge them in this much healthier version. 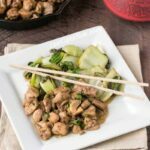 Hope you enjoy this easy chicken recipe! 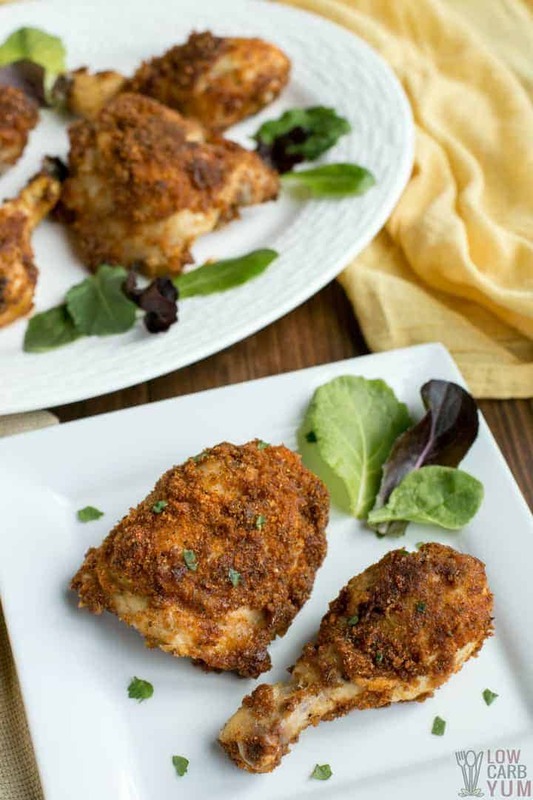 It's easy to make fried chicken in an air fryer. But if you don't have this trendy appliance, the chicken can be baked in a regular oven instead. 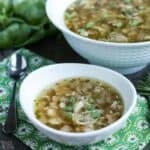 Place chicken in a large bowl. Mix almond milk and vinegar then pour over chicken. Let the chicken soak in the liquid for 2 hours in the refrigerator. In wide shallow bowl or dish, combine pork rinds, salt, thyme, basil, oregano, celery salt, black pepper, dried mustard, paprika, garlic salt, ground ginger, and white pepper. 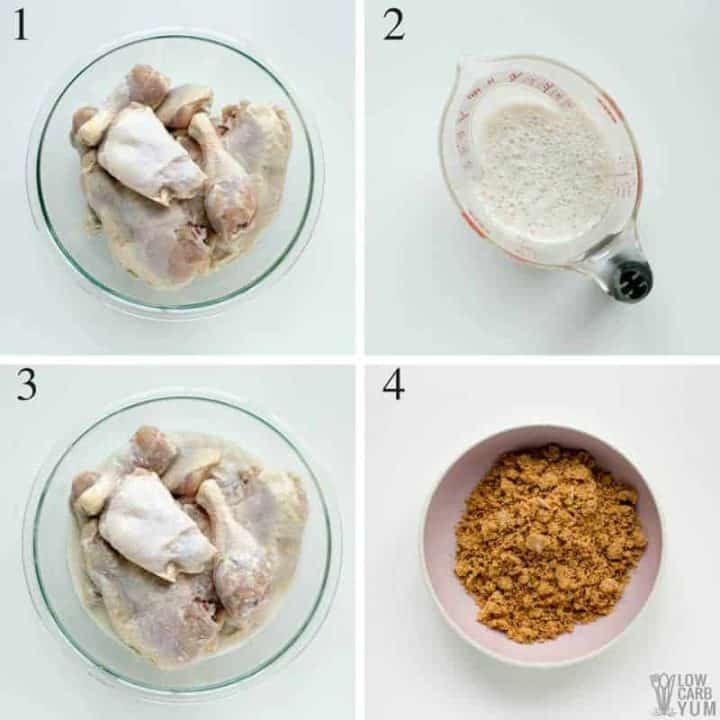 Dip each piece of chicken in dry pork rind mixture until coated. Spread 1 tablespoon coconut oil in bottom of air fryer basket. Arrange chicken in single layer on basket. Air fry at 360°F for 10 minutes, rotate, then air fry another 10 minutes. Test chicken temperature to reach 165°F and continue cooking if needed. 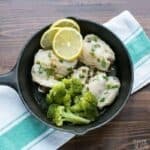 Arrange chicken on a rack in baking pan. Bake at 350°F for about 50 minutes or until meat reaches 165°F. The spices used comes from what is believed to be the blend for Kentucky Fried Chicken.